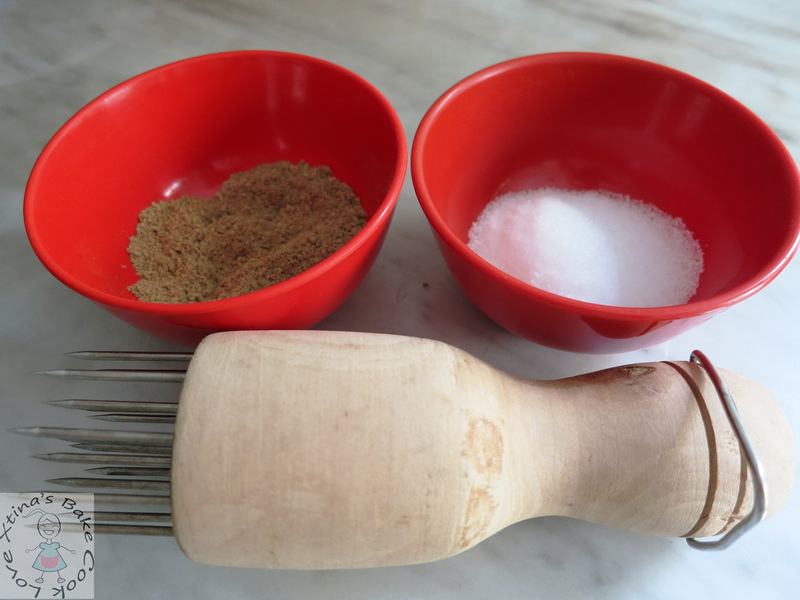 The three items that are crucial for making a crispy roast pork – five spice powder mixture (five spice powder + garlic salt + white pepper), salt and the special skewer to prick the skin of the roast pork (can be bought from wet markets). For the dry rub (five spice powder mixture), it was adapted from Nasi Lemak Lover – 2tsp garlic salt + 1tsp five spice powder + 1 tsp ground white pepper. She used this amount for a 2.8kg pork belly, I used around 2/3 of it for my 700g. Method-wise, it’s a mixture from the neighborhood aunties, Blessed Home Maker who had also air-fried her crispy roast pork and Nasi Lemak Lover who oven-roast. 2. Remove from water and let it air-dry in the open (around 3 to 4 hours). Pluck excess hair if any. 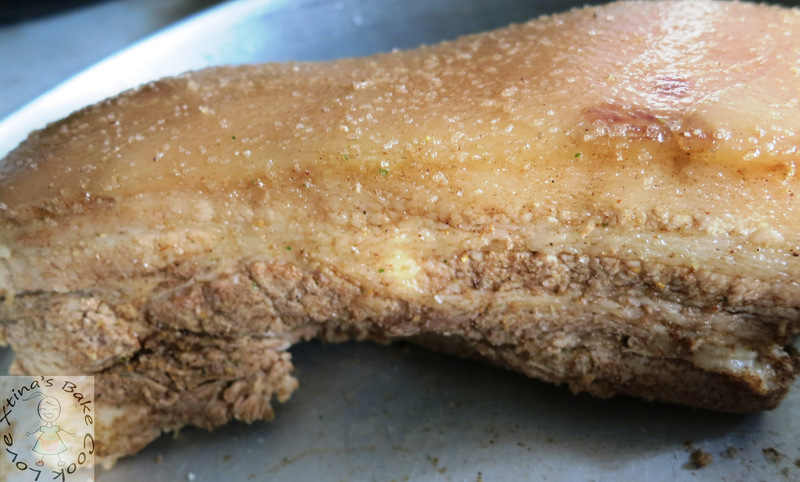 After air-frying for one-hour, you will be rewarded with this golden brown and crispy skin roasted pork! Doesn’t the color looks so amazing and satisfying? I did a CRISPY ROAST PORK! It’s HOMEMADE! I am so proud of myself. After letting it cool in the air-fryer basket for awhile, the slicing ceremony takes place! It truly looks so amazing. And I love the dry rub! And at first Mr Boyfriend was worried that the roast pork will turn out very salty, but it’s not! The skin is not salty and the meat is not salty. But the garlic salt did give the meat a slight spiciness but nothing too overwhelming. 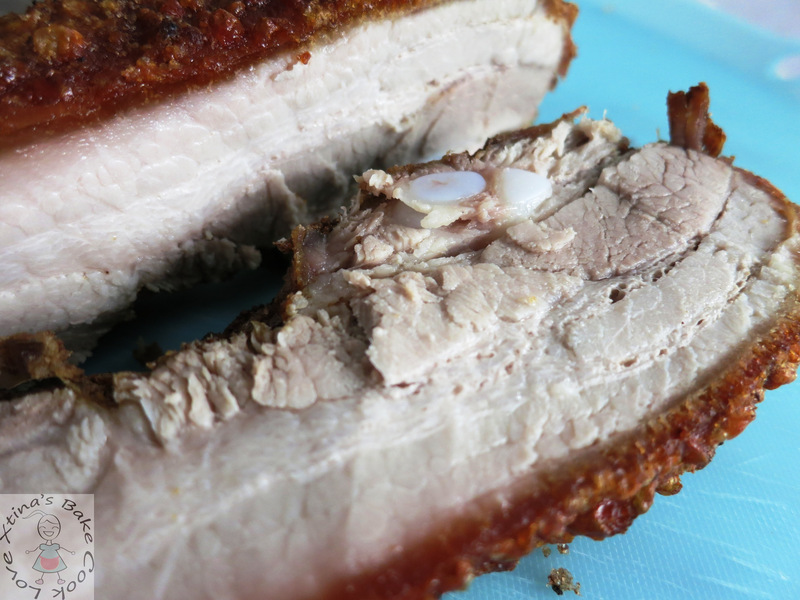 Overall, the dry rub is a very nice seasoning to the roast pork. Please please please remember to prick the skin as much as you can. Don’t be worry with damaging the skin. We though we pricked sufficiently but some parts were missed can came out slightly chewy but overall, the skin was still crispy. Very tasty crispy roast pork! Will I do this again? DEFINITELY a YES! It is worth the effort and time. But will I do this without an air-fryer? No, because the oil from the pork splatter all over the place. Btw, I never prick the skin. I merely use a knife to score it, the skin always end up crispy. Serious? Nv prick? Everywhere I read and fr aunties all prick.. So I followed.. Pretty fun to do it also..
Oven baked took me almost 2 hours but the Airfryer is under an hour for the same size meat. And yes, no prick. Just score the skin, the score lines are about 1cm apart. Good for people like me without the gadget. Reblogged this on princessmic's diary. Do u cook the pork then marinate and leave it overnight? The other method is dun cook the pork.. just rub with the dry rub mix and put into the fridge uncover overnight.. see which u prefer..
Air frying time and temp is the same for both method..
HI there. The step 6, after apply lemon/lime juice then followed by salt, the salt is coarse salt or fine salt? Do we need to remove the salt half way while baking or just leave it? Salt is just for the skin right? How much do I need to put? Thank you! Should this be 30 mins for both? hi.. it is 30mins each.. meaning an hour in total cooking time..
Glad you and your family loves it! Do you have to pre cook the pork? Hi Marie, I tried with another recipe before that doesn’t require pre-cooking the pork but to chill it open, skin up in the fridge for a couple of hours. Hope it helps.